A 35-pound king salmon caught near Ketchikan, the angler's first king. King salmon are the most highly preferred species of fish sought after by sport anglers fishing in Southeast Alaska (SEAK), and are equally valued by the commercial fishing industry. Fisheries management for this salmon species is complex, and involves regulatory processes in both international and domestic venues. Each year Alaska’s king salmon all-gear harvest quota is established according to guidelines contained in the U.S./Canada Pacific Salmon Treaty (PST), which was recently renegotiated for 2009-2018. Since 1999, this quota has been based on the coastwide abundance of king salmon that migrate through SEAK and is expressed as an index referred to as the SEAK king salmon abundance index (AI). The AI is updated with new information annually using a complex statistical model. After the model generates the index and it is calibrated for accuracy, the AI and associated harvest quota is released to agencies and the public—usually in late winter prior to commencement of most fishing. The Alaska Board of Fisheries (BOF) allocated Alaska’s share of the quota to the drift gillnet, set gillnet, seine, troll, and sport fisheries. The net fisheries are allocated approximately 7% of the quota and the remainder is split 80/20 between the troll and sport fisheries, respectively. The SEAK sport fishery is specifically managed under the terms set out in the Southeast Alaska King Salmon Management Plan (Plan), and was initially adopted by the BOF in 1992. The Plan was crafted by a task force comprised of stakeholders representing each gear group which included commercial users. Two main guiding principles of the Plan are to allow uninterrupted sport fishing in the marine waters for king salmon while not exceeding the allocation and minimize regulatory restrictions on resident anglers. The Plan contains a suite of management tools for ranges of AI’s that are used to restrict or liberalize opportunity for sport anglers and over time these tools have been modified by the BOF. In 1997, the BOF determined that stability was important to the sport fishery and that inseason regulatory actions should be minimized. In 2000 to provide added stability to the sport fishery, the BOF decided that regulations for the season would be established prior to May 1st and would remain in effect for the entire season. In 2002, given growing concerns of increasing non-resident angler participation in the SEAK fishery and a pattern of exceeding the sport allocation, the BOF requested another task force to work toward developing options within the context of the Plan to keep the sport fishery from exceeding its allocation. 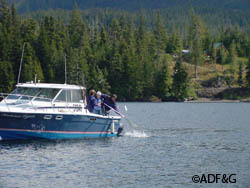 Skip and Louise Pattison landing a king salmon while fishing on the sport charter vessel Katrina Lynn near Ketchikan on a bright sunny day. Photo courtesy Mike Wood. Recommendations from this task force were adopted into regulation in 2003 and included management measures to reduce harvests by non-resident anglers, minimize impacts to resident anglers, and keep the sport fishery within its allocation (on average). In 2006, the BOF again revised the Plan by adding management options designed to increase sport harvests at high AI levels (above 1.5) and to reduce sport harvests at low AI levels (below 1.1) by emergency order. 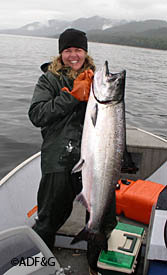 And finally in 2009, the PST was renegotiated and Alaska’s king salmon all-gear harvest quota was reduced by 15% prompting the BOF to add new management tools to the Plan that further restrict annual limits for non-resident anglers. Management actions implemented in the sport fishery from 2003 to 2008 have kept the sport fishery within its allocation in four of the last six years, and overages have been small (<2%), with a six year average underage of 17.4%. Enhancement activities in SEAK involving hatchery produced king salmon also play a key role in the sport fishery. Although not directly tied to the Plan, established Terminal Harvest Areas (THAs) do allow for additional opportunity for both residents and non-residents especially in years when the AI is low and regulations are restrictive. King salmon caught in these THAs are of Alaska hatchery origin and do not count towards the all-gear quota. Additionally, THA’s reduce harvest pressure on nearby wild stocks. During June of 2010 for example, in the Juneau area over 70% of the surveyed fishing effort and over 90% of the king salmon harvested came from the THA near Juneau. Ketchikan showed a similar set of statistics during that time period as well. Eleven year old Emily Wood hoisting her recently landed king salmon while fishing with her father near Caamano Point near Ketchikan. Photo courtesy of Mike Wood. The 2011 preseason AI of 1.69 was released on March 31st and provided for an all-gear quota of 294,800 fish. The allocation to the sport fishery is 54,515 king salmon and triggered the use of management tools that allow Alaska resident anglers to harvest 3 fish per day and in possession. Non-residents anglers can harvest 2 fish per day and in possession during May, then 1 fish per day and in possession after May with an annual limit of 5 fish. The management measures also allow the use of 2 rods per angler from October 1, 2011 through March 31, 2012. This years’ high AI is far and above better than the low encountered in 2008 (1.07) which resulted in a quota to the sport fishery of only 31,350 fish and very restrictive management measures to keep the sport fishery within its allocation. Those measures included line limits on charter vessels, 1 fish per day and in possession for residents and non-residents, a 1 fish annual limit for non-residents, and a 48” minimum size limit for non-residents. So given the relatively high AI this year compared to the recent past, dust off the rods, grab the bait and hit the water because it’s game on!